A classic style DS Caimano watch by Swiss watchmaker Certina, styled with a brown leather croc effect strap & a shining gold plated case. A sleek silver tone dial features quartz movement, date window at 6 o'clock & a mix of gold tone hour markers & Arabic Numbers. Ideal to wear with both business and casual attire. 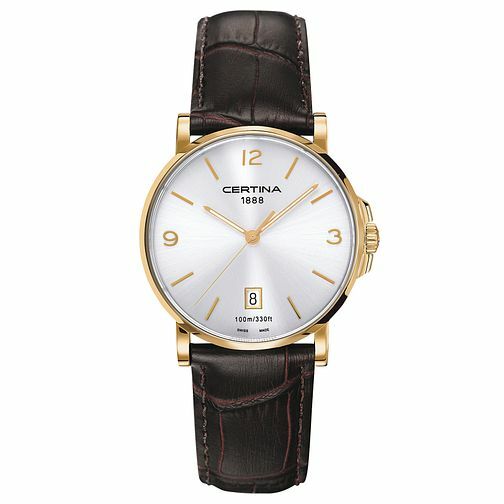 Certina DS Caimano men's brown leather strap watch is rated 5.0 out of 5 by 1. Rated 5 out of 5 by Anonymous from Very nice watch. A very nice looking watch, light weight and comfortable on the wrist. Worn as a dress watch. Some minor disappointment in that fingers and numerals not as easily seen in subdued light.